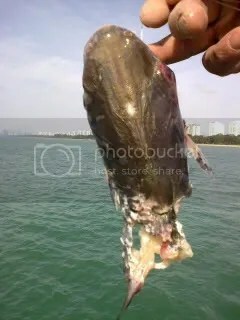 This is what happen when U tie your catches in the water below the jetty. It already happen few time back. Grouper, cat fish, sickle fish all ended with only the head left. Someone there below is sharing your catches. So next time U want to keep your catches alive, think twice.